Moved from the errata page as not a real erratum. The text for this diagram indicates that is worth 10 points, but because white a is not sente, I think it is only worth 8 points. 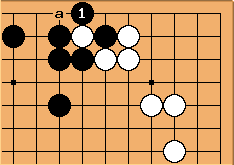 Bill: The normal assumption is that White cannot afford to make ko if Black hanes, leaving the next diagram as sente for Black. Shaydwyrm: When I woke up this morning I realized my mistake, only to find you had already fixed it! The ambiguity adds a little subtlety to the position that I would not have thought of.